“Our world is shown as colourless and poverty-stricken. Yes, we are economically poor but not culturally so. Where is the depiction of our vibrant culture, music and food? Why is our world shown bereft of it all?” asks Kaala director Pa Ranjith. As Kaala, Rajinikanth plays a leader of slum-dwellers, who challenges the relentless displacement of the poor in a metropolis. For his directorial debut, the 2012 film Attakathi, Tamil filmmaker Pa Ranjith shot a track, Adi en gaana mayil. He had grown up listening and dancing to the folk song, which was sung at funerals to the beats of the parai melam, a percussion instrument made of leather, and thus considered inauspicious. The song made it to the top of the charts and playlists of parties and temple festivals across Tamil Nadu. “I grew up on such songs but this tradition had never been reflected in our cinema. So, when people took to the song, it felt like an acknowledgement of the Dalit culture that is otherwise missing from the mainstream,” says the 35-year-old filmmaker. Since then, Ranjith has honed his politics to assert his Dalit identity through the cinema he makes. His last, Kabali (2016), for instance, had Rajinikanth play the leader of a gang of Tamilians in Malaysia. It tells the story of Tamil Dalits who were taken to Malaysia by the Britishers as indentured labour. His next, Kaala, which released this Friday, is set in Dharavi, a settlement once dominated by Tamil Dalits. As Kaala, Rajinikanth plays a leader of slum-dwellers, who challenges the relentless displacement of the poor in a metropolis. The promos suggest a generous use of Dalit symbolism. Take, for instance, Kaala’s jeep number, MH 01 BR 1956, a reference to the year BR Ambedkar led the mass conversion of Dalits to Buddhism; or the blue that dominates the slums in the form of cloth, drums, tarpaulin sheets. The film’s teaser begins with the chant of “Poraduvom (We will fight)” and ends with the Ambedkarite exhortation, “Kattravai, pattravai (educate, agitate)”. To the filmmaker, the symbolism is secondary; it’s the assertion that forms a crucial part of his cinema. “There have been films in the past that depict Dalit characters and lives. They were made by non-Dalits, who view us through a lens of pity. Our world is shown as colourless and poverty-stricken. Yes, we are economically poor but not culturally so. Where is the depiction of our vibrant culture, music and food? Why is our world shown bereft of it all?” he says. Most films that address caste confirm Ranjith’s analysis. They depict Dalits in minor roles of poverty and helplessness. One of the Hindi film industry’s biggest commercial successes, Lagaan (2001), for example, celebrates this kind of token “inclusion”. While the rest of the village’s makeshift cricket team shuns the “untouchable” Kachra, Aamir Khan’s Bhuvan embraces the crippled man and deigns to include him in the team as a spinner. “I understand that films such as Jabbar Patel’s Mukta (1994, about an upper-caste woman who falls in love with a Dalit activist) are well-intentioned. But why do these films have to adopt a patronising tone?” asks Marathi filmmaker Nagraj Manjule, whose films Fandry (2013) and Sairat (2016) broke new ground in the depiction of caste relations. Sairat, a love story with Dalit actors in the lead, broke several box-office records to enter the elite Rs 100-crore club usually reserved for films by the Khans. Nagraj Manjule’s films Fandry (2013) and Sairat (2016) broke new ground in the depiction of caste relations.With films like Newton (2017) and Mukkabaaz (2017), Hindi cinema, too, appears to be have embarked on a tentative exploration of caste. Newton signals this tacitly, with a blink-and-miss glimpse of Ambedkar’s portrait in Newton’s house or a discussion of Adivasi food preferences (Anjali Patil’s Malko telling Newton why red ants make for great chutney). Mukkabaaz is more overt, with a lower-caste protagonist who works for a Brahmin, but the film never dives too deep. But, in the film, every character is vocal about their caste. The reason caste has been able to survive is precisely because it isn’t spoken of openly. People don’t talk about it the way characters in Mukkabaaz do,” says Somnath Waghmare, a Dalit documentary filmmaker and research scholar at Tata Institute of Social Sciences, Mumbai. Waghmare is working on a thesis that maps Dalit voices in Indian cinema. When filmmakers from the so-called “lower” castes tell their stories, they not only aim to correct the near-erasure of their history and existence from popular culture; but they also wish to tell stories from the inside, which humanise the life of Dalits and depict it in all its complexity. Take, for instance, Neeraj Ghaywan’s Masaan, where one of the six principal characters belonged to the Dom community of Varanasi that is designated to handle and burn corpses. Played by Vicky Kaushal, Deepak’s is essentially a love story. “But one is able to sense Deepak’s aspiration, a thread that is common in the depiction of all low-caste characters in movies by Dalit filmmakers,” says Waghmare. “One can see it in Manjule’s films. Be it little Jabya of Fandry or Parshya in Sairat,” he says. If such representations have rarely made it to the big screen, it is a reflection of the casteism inherent in the Indian film industry, and the tiny number of Dalits who work in it. Manjule recounts that in 2013, during Fandry’s promotion, a journalist pointed out that he was the first Dalit filmmaker to talk about caste in his movie. “That was the 100th year of Indian cinema and I told the journalist that if that is the case, it has taken a hundred years for a Dalit to make a film in India,” says Manjule, who believes that few Dalits are empowered enough to identify as Dalit. Fandry went on to win international acclaim, but, more importantly, it pushed the discussion about caste into the mainstream. Neeraj Ghaywan “came out” as a Dalit on Twitter, following an unsavoury comment by filmmaker Vivek Agnihotri.Earlier this year, following the Bhima Koregaon protests in Maharashtra, Ghaywan “came out” as a Dalit on Twitter, following an unsavoury comment by filmmaker Vivek Agnihotri. Not everyone has the courage Ghaywan displayed under the circumstances, only to face a torrent of abuse on social media for using the “Dalit card”. Many in the film industry choose to conceal their Dalit identity. “So many prominent names have reached out to me after watching my films. They call or meet me with a ‘Jai Bhim’, choosing to reveal themselves to me but not to others,” says Manjule, adding that he had not been aware that so many actors and technicians in the Marathi and Hindi film industries are Dalits. Two years ago, the son of the late lyricist, Shailendra, who wrote some of Hindi cinema’s most memorable songs — from Piya tose naina laage re in Guide to Pyar hua iqrar hua in Shree 420 — announced at a public event that his father had belonged to the Dhursia caste, a cobbler community from Bihar. “Growing up, my parents did tell us that we were from a low caste but I never understood what that meant until my late 20s, when I started to research my father’s life,” says Dinesh Shankar Shailendra. Unable to understand why his father, a successful lyricist and poet of his time, did not receive any national or state awards, Dinesh went to a village in Arrah district, where his grandfather was born and found that he had managed to break the cycle of oppression. “I learnt that he chose to educate himself despite the discrimination, sitting five rows behind others in the classroom. He found a job as a contractor in the British army and eventually got posted to Rawalpindi, where my father was born.” While Shailendra didn’t experience caste discrimination, he was acutely aware of it, perhaps because he had seen his father suffer. “Except one incident that he wrote of in his diary: Once, while playing hockey, some upper-caste boys had sniggered, ‘Now, we will have to play with these kind of people’. That strengthened my father’s resolve to move to Bombay,” says Dinesh, who is writing a script on his father’s life. In Bombay, Shailendra was drawn to the Communist movement, and became one of Indian People’s Theatre Association’s founders. Collaborating extensively with Raj Kapoor, who gave him his first break, Shailendra wrote lyrics that often spoke of the socialistic ideals of independent India. “But he was aware of the ways in which caste operates and oppresses. Take, for example, the song sung by a cobbler, Thahar zara o jaane wale, in Boot Polish (1954), where he says: Pandit ji mantar padhate hain, woh Ganga ji nahlaate hain/Hum pet ka mantar padhate hai, jute ka muh chamkaate hai. Pandit ko panch chavannee hai, humko toh ek ikannee hai/ Phir bhed bhav yeh kaisa hai, jab sab kaa pyara paisa hai,” says Dinesh about the song which mocks the priest’s superiority. Many film professionals would understand why Shailendra chose to keep his identity a secret. “In today’s politically correct world, caste discrimination doesn’t exist in the conventional way. But the fear of being outed is deep-seated,” says a respected filmmaker, who did not wish to reveal his identity. “Our ‘place in the society’ has been grilled into us from a very age. There is a constant fear of being seen as lowly by one’s friends and colleagues. The fear is so real and raw that, sometimes, I wonder what my upper-caste house help will think of me if she found out that I am a Dalit,” he says, the vulnerability visible in his eyes. 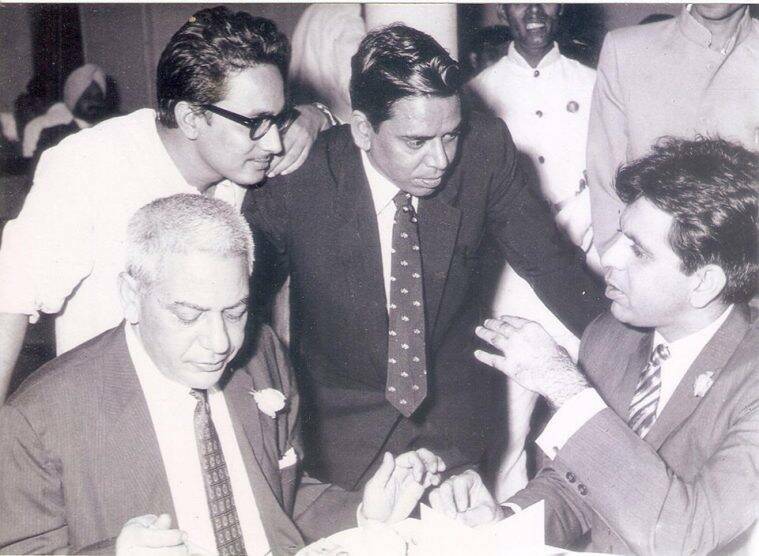 Shailendra (in black) with Dilip Kumar.Manjule seconds this. “When I came in the industry, I used to be scared of who I am, of how I look, of my last name, of my choices that would give away my caste identity. The language I speak is a raw version of Marathi that the upper caste speak. It’s considered ‘impure’. It took me a while to understand that any language is kept alive by the working class. Language’s purpose is expression and if whatever dialect I speak can help me express and communicate, it cannot be dismissed,” says the director, who used his local dialect in both his films. Fandry’s producer had initially asked him to avoid it but Manjule stood his ground. Sairat’s success, ironically, made the rural argot fashionable, triggering a trend in Marathi television shows and films. Ranjith argues that the first step in liberating oneself of these complexes is to take a stand and talk about one’s Dalit identity. “The inferiority complex is a part of every Dalit’s life. Growing up, there was a toy store near my house that would stock every toy except the spinning top, which was available at the store in the upper caste settlement. I would tell myself I shouldn’t want that top because if I do, I will have to go across the store and be subject to humiliation. Over time, I realised I have no reason to feel inferior. If my poverty and my ways bother people, the problem lies with them and the society they have created,” he says. More importantly, caste is almost impossible to disown. “It’s in people’s nature, their choices, their expression. One can tell your caste based on what they like, what music they listen to or even how they name their film. You will never hear of a Gulabjaam made by Nagraj Manjule,” says Manjule, referring to Sachin Kundalkar’s recent release, which was criticised for passing off upper-caste vegetarian dishes as Marathi cuisine. Nishant Roy Bombarde, who has worked in the media industry for a few years, recounts the everyday casteism of the film world. “A badly dressed person is called bhangi. Anything that was disgusting is dismissed as chuda-chamar. When looking for ‘good-looking’ lead actors, people would look for Brahmin girls and boys or casually confirm if a certain surname was upper caste,” says the 35-year-old whose 2015 Marathi short film, Daaravtha, won the National Award. In the short, Bombarde tells the story of a young boy confused about his sexuality. A tiny thread in the film also touches upon caste, which he feels has been an integral part of his identity. Waghmare’s research reveals that characters in Marathi films who share his last name are usually peons, criminals or in other petty jobs. “This comes from conditioning and adds to it as well. It manifests in interesting ways. Last year, at a screening of my documentary film on Bhima Koregaon, a woman stood up to confirm if the ‘fair-complexioned’ professor in my film was indeed a Dalit,” he recounts. Bollywood’s power politics, on the other hand, rests in denial. Rumour is that Sairat’s remake in Hindi has done away with the caste angle. Director Abhishek Chaubey agrees that caste isn’t blatant in Bollywood. “No one will ask, ‘Tumhari jaat kya hai?’ But I look around me and all I find are Chaubeys and Bhardwajes. That’s as in-your-face as caste can get… I grew up in Ranchi, being able to afford a missionary school education that a lower caste person may not be able to. When I come to Bollywood, the chances are higher that I will be given an opportunity for the English I speak and the way I present myself,” he says. Chaubey recently finished shooting for Sonchiriya, an action film set in Chambal of the 1970s. The director says most of his protaginists are upper caste, except one, and he tells the story of caste oppression but from the oppressor’s point-of-view. Manjule agrees but adds that one of the crucial ways to escape such hurdles is by making sure the film isn’t lacking in craft. “If you overlook the caste angle in Sairat and Fandry, the films are still entertaining. They manage to move the audience. This makes it easier for me to tackle production roadblocks and reach a wider audience,” he says. There is also, however, a simmering anger against fellow Dalit-Bahujans, who not only chose to conceal their caste but also adopted Brahmanical symbols. For instance, a young filmmaker who made a successful film using a Brahmin protagonist. Or Marathi actor Bhau Kadam, who was at the receiving end of fellow Buddhist-Dalits’ ire in 2017 after he installed a Ganesha idol during a festival. Bombarde feels that the anger isn’t unfounded but he also empathises with them. “It’s an inner battle for acceptance,” he says. Vardhan’s colleague T Ramalingam, the art director on Kaala, says that the fight is about claiming ownership of the story of their lives. “You may find the slum I grew up in filthy but it was home to me, I will see beauty in it.” He cites the example of the 2015 National Award-winning Tamil film Kaaka Muttai, pointing out that it has the same setting as Ranjith’s Madras. “But it lacks the colour and vibrancy that we grew up seeing. In our houses, there was a separate spot to keep pots where sometimes rats would sneak in. While an outsider would view them with revulsion, as pests, we used to play with them.” Which story is less valid? Which narrative will win? The answer, says Manjule, is in assertion.